Add vinegar to a small saucepan, bring to a boil over medium heat and allow to boil until reduced by half, about 3 minutes. Pour into a jar or bowl, add olive oil, dijon mustard, honey and whisk to blend while seasoning with salt and pepper to taste. Thin with a little water if desired. Set aside. Add walnuts, brown sugar and butter to a small non-stick skillet and cook over medium-heat, stirring constantly until sugar starts to melt and caramelize, about 2 - 3 minutes. Transfer to a plate in a single layer to cool. 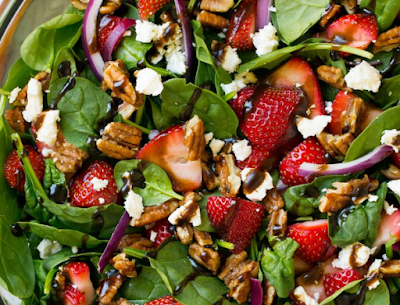 In a salad bowl toss together spinach, strawberries, half of the feta, red onion and pecans. Drizzle about 1/3 of the dressing over salad then plate and drizzle remaining dressing over individual portions and top with remaining half of the feta. Serve immediately. 0 Response to "Strawberry Spinach Salad with Candied Pecans Feta and Balsamic Vinaigrette"